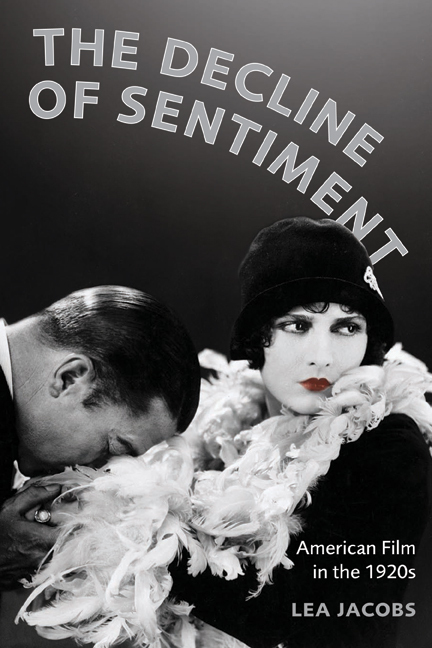 The Decline of Sentiment seeks to characterize the radical shifts in taste that transformed American film in the jazz age. Based upon extensive reading of trade papers and the popular press of the day, Lea Jacobs documents the films and film genres that were considered old-fashioned, as well as those dubbed innovative and up-to-date, and looks closely at the works of filmmakers such as Erich von Stroheim, Charlie Chaplin, Ernst Lubitsch, and Monta Bell, among many others. Her analysis—focusing on the influence of literary naturalism on the cinema, the emergence of sophisticated comedy, and the progressive alteration of the male adventure story and the seduction plot—is a comprehensive account of the modernization of classical Hollywood film style and narrative form. Lea Jacobs is Professor in the Department of Communication Arts at the University of Wisconsin-Madison. She is author of The Wages of Sin: Censorship and the Fallen Woman Film, 1929-1942 (UC Press) and Theatre to Cinema: Stage Pictorialism and the Early Feature Film.